Southeast Alaska encompasses the 17 million acre Tongass National Forest. Together with the coastal old-growth forests of British Columbia, this is the largest temperate rainforest ecosystem in the world. Semi-enclosed by land, the whole Panhandle archipelago represents a single estuarine system that ranks among the largest and most complex in the world. This nutrient rich environment is the preeminent feature of the region, supporting an abundance of animal and plant life, including one of the planet’s most prolific wild salmon ecosystems. Cool, saturated air from the North Pacific creates a moderate maritime climate with abundant rainfall, averaging more than 100 inches per year. Remarkably, the Panhandle has over 350,000 acres of tidal estuaries, where voluminous runoff carrying nutrients from the land mixes with powerful oceanic tides that are rich in marine nutrients. Estuaries are also the ecological link for species that move between rivers and the sea. All of this adds up to an extraordinarily productive ecosystem. Semi-enclosed by land, the whole Panhandle archipelago represents a single estuarine system that ranks among the largest and most complex in the world. This nutrient rich environment is the preeminent feature of the region, supporting an abundance of animal and plant life, including one of the planet’s most prolific wild salmon ecosystems. The waters close to shore are also essential for commercially valuable shellfish. And few people realize that fish caught far out at sea—such as rockfish and black cod—spend their early lives growing in the nearshore waters and bays of Southeast Alaska. Eelgrass beds are an especially important part of this nursery habitat, and remarkably, the Panhandle has more eelgrass beds than Washington, Oregon, and California combined. Click here for a detailed 2009 map of Southeast Alaska's watersheds. Spatial patterns of estuarine biota suggest that some nearshore ecosystems are functionally linked to interacting processes of the ocean, watershed, and coastal geomorphology. The classification of estuaries can therefore provide important information for distribution studies of nearshore biodiversity. However, many existing classifications are too coarse-scaled to resolve subtle environmental differences that may significantly alter biological structure. We developed an objective three-tier spatially nested classification, then conducted a case study in the Alexander Archipelago of Southeast Alaska, USA, and tested the statistical association of observed biota to changes in estuarine classes. At level 1, the coarsest scale (100–1000’s km2), we used patterns of sea surface temperature and salinity to identify marine domains. At level 2, within each marine domain, fjordal land masses were subdivided into coastal watersheds (10–100’s km2), and 17 estuary classes were identified based on similar marine exposure, river discharge, glacier volume, and snow accumulation. At level 3, the finest scale (1–10’s km2), homogeneous nearshore (depths <10 m) segments were characterized by one of 35 benthic habitat types of the ShoreZone mapping system. The aerial ShoreZone surveys and imagery also provided spatially comprehensive inventories of 19 benthic taxa. These were combined with six anadromous species for a relative measure of estuarine biodiversity. Results suggest that (1) estuaries with similar environmental attributes have similar biological communities, and (2) relative biodiversity increases predictably with increasing habitat complexity, marine exposure, and decreasing freshwater. These results have important implications for the management of ecologically sensitive estuaries. View the shoreline and coastal habitats anywhere in Alaska! 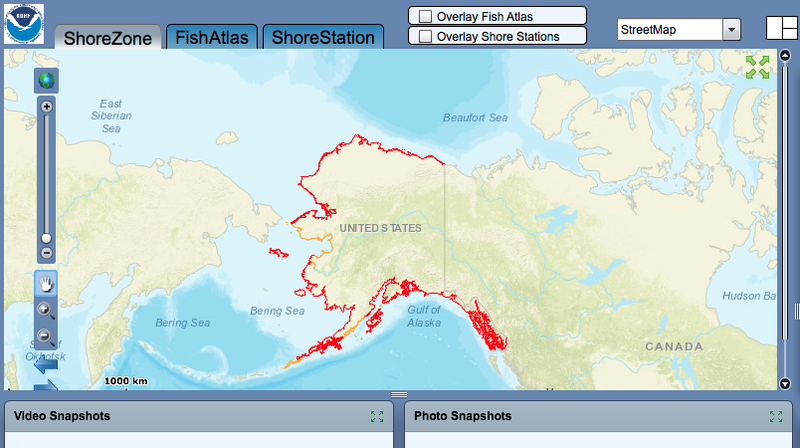 Thanks to NOAA and a number of other organizations you can now view the shoreline just about anywhere in Alaska. 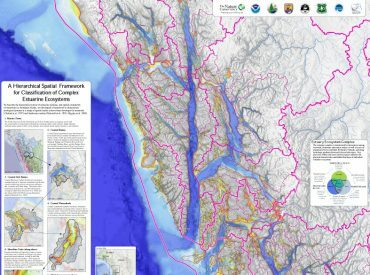 The Alaska ShoreZone Coastal Mapping and Imagery program allows you to "fly the coastline", view and download images of your favorite places, and access physical and biological data via their interactive website. Click here to visit your favorite Alaskan coastal habitats! Marine protected areas (MPAs) are essential for protecting critical habitat that is important for supporting healthy ecosystems. According to NOAA, "Marine protected areas (MPAs) in the U.S. come in a variety of forms and are established and managed by all levels of government. There are marine sanctuaries, estuarine research reserves, ocean parks, and marine wildlife refuges. Each of these sites differ. MPAs may be established to protect ecosystems, preserve cultural resources such as shipwrecks and archaeological sites, or sustain fisheries production." Each MPA can have varying levels or different conservation focuses, levels of protection, permanence of protection, constancy of protection, and scale of protection. For more information, definitions, and classification schemes click here. Click here to access a downloadable version of the map below. Salmon is an extremely important resource that connects Alaskans across the State. Salmon are anadromous, meaning they spend time in both fresh and salt water. Salmon are biologically incredible creatures. When it is time to spawn salmon return to the exact stream in which they were born, sometimes traveling 2,000 miles, at a rate of 30 miles per day, during their journey from ocean to stream. They have an extraordinary drive and chemical imprint that allows them to complete this incredible feat of navigation. When the time comes, salmon use all their stored energy to battle their way up river. When they finally reach their destination, salmon make a nest and the females lay thousands of eggs with the last bit of energy they have. Pacific Salmon die after spawning, their bodies filling the river with valuable, essential nutrients for their new young. What an incredible journey! The above information is courtesy of the Salmon Project; to read more on salmon's lifecycles click here. There are five types of salmon that are found in the waters from Southeast Alaska to the Arctic Ocean. Each of these five salmon are commonly known by two different names. King or Chinook salmon are Alaska’s largest salmon and also the state fish. This incredibly large and incredibly yummy species spends 3-4 years in the ocean before returning to the exact stream it was born to spawn. 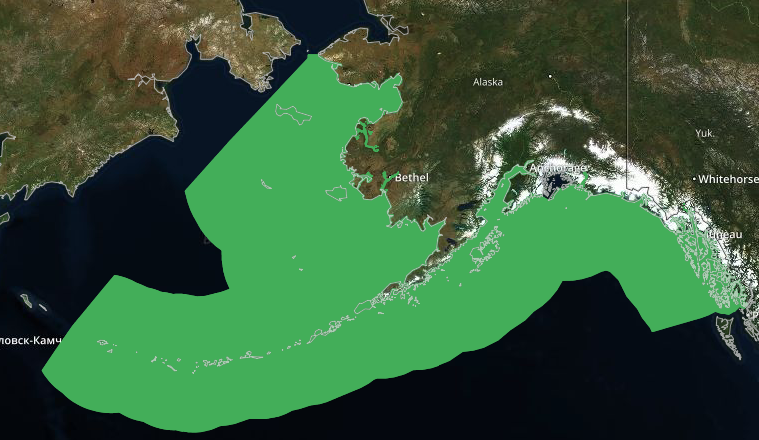 The Gulf of Alaska Data Integration portal has created numerous maps displaying essential fish habitat (EFH) for many economically and ecologically important marine species. Silver or Coho salmon are commonly caught from July to August, but can be caught as late as October. Coho tend to stay closer to shore than Kings and are said to defend their territory with a complex dance known to scientists as the “wig-wag dance”. The meat of Coho is dark pink and of high quality. The Gulf of Alaska Data Integration portal defines EFH as "those waters and substrates necessary to fish for spawning, breeding, feeding or growth to maturity." Red or Sockeye salmon have a dark red meat compared to other salmon species and are easily recognized when they spawn by their bright red bodies and green heads. This color change is due to the dissolution and absorption of their scales, which exposes carotenoid pigments gained from their ocean diet. Unlike other salmon species Sockeye salmon only spawn in streams that eventually lead to lakes. According to The Gulf of Alaska Data Integration portal, EFH 'waters' include "aquatic areas and their associated physical, chemical and biological properties." Chum or Keta salmon are known for their unique “tiger stipe” patterns of red, purple, and black when they are spawning. Chum salmon are second in size to Kings and found on both the North American and Asian coasts. The name Chum stems from the word tzum, which means “spotted” or “marked”. According to The Gulf of Alaska Data Integration portal, 'necessary' EFH means "the habitat required to support a sustainable fishery and the managed species' contribution to a healthy ecosystem." Pink or Humpy salmon are the smallest and most abundant of the Pacific salmon. Pre-spawning males are known for the large hump they develop on their backs. Pink salmon spawn every two years and as such are composed of two different stocks that rarely interbreed. According to The Gulf of Alaska Data Integration portal, these maps include areas essential for "spawning, breeding, feeding, or growth to maturity." As a result each EFH maps encompass "all habitat types utilized by a species throughout its life cycle." How do we commercially Harvest salmon? 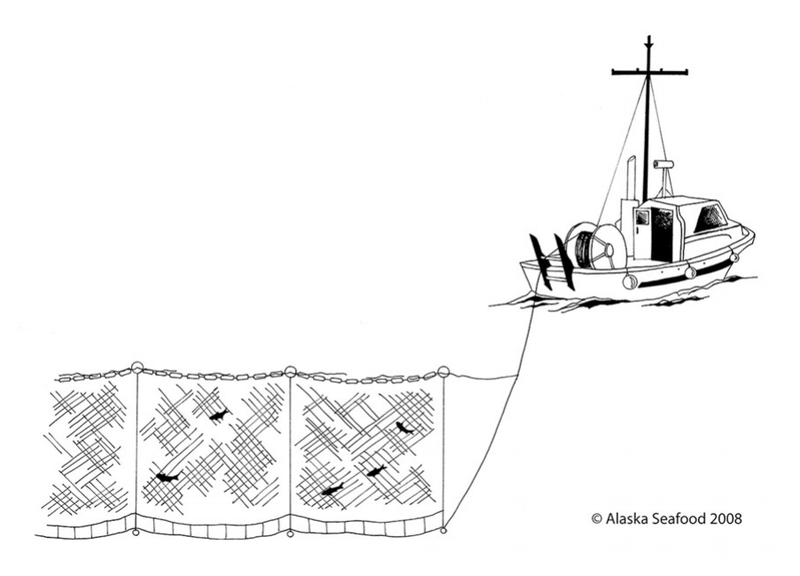 Images courtesy of (respectively): Alaska Wild Harvest, Iliamna Fish Company, Alaska Seafood, and Alyssa Russell.